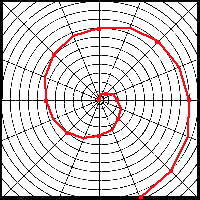 02:39:04 Tonights demo will be about spirals and scrolls. Specifically laying them out and making jigs. 02:40:40 I generally just bend scrolls by eye but many need to lay them out. 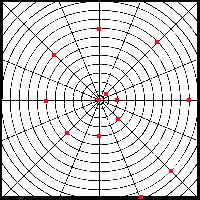 The easy way is on a grid like this. 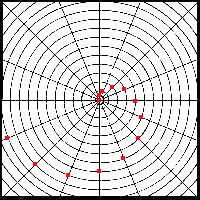 02:44:38 Here we have placed a point on each 90 and 45 degree line moving out one circle at a time. 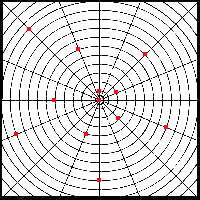 02:46:35 If you put a point on every dividing line as you move out the circles you get a faster more open spiral. 02:48:25 But you can also skip more than one dividing line and get a slower tighter spiral. 02:51:22 Here we have skipped 2 lines between each point. When we layout the scroll we can divide the "skipped" lines into thirds to make a smoother spiral. 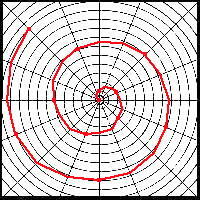 02:53:34 Using the same grid you can layout any kind of spiral to any scale. 02:54:49 Once you have your spiral scrolls laid out you will want to make a jig if you need to make more than a few exactly alike. 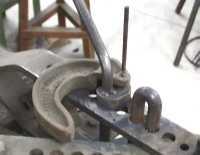 02:55:40 There are several methods of making scroll jigs or benders. 02:57:32 This simple jig is made of 1/8" angle iron and 1/8" by 1" flat bar. It was used to make identical scrolls in 1/2" square stock. 02:58:11 The image is out of shape due to the rectangular image being forged into a square. . .
03:00:06 This jig was used to make two ends of an "S" scroll that were different sizes. One end was pulled around to a chalk mark roughly at the cross bar, the other was pulled all the way around. 03:01:07 Using the same jig for both ends gives a pleasing sense of continuity. 03:02:46 This jig is made from a forged "fish tail" scroll. The tapering stock forges more naturally into a scroll if you are working by eye. 03:10:13 The fishtail also sticks up higher than the other parts so that you get the effect of a stepped or progressive jig that can make more than one turn. 03:11:59 This jig is also welded to a piece of angle iron so that it can be clamped in a vise. Vise mountable tooling is one of the handiest things you can do in the blacksmith shop. 03:13:15 This is a scroll bender attachment for a Hossfeld bender. 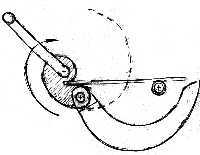 03:14:28 It works by having a hinged portion that swings out of the way so that the bar to be bent can be inserted. 03:15:52 As the stock wraps around the bender the hinged portion can swing in and a spiral of more than 360 degrees can be bent. 03:17:27 Normally these production benders produce an ugly flat end on the stock. However, if you are forging a bean end or fishtail on your scroll you can make a bender like this that accepts that style end. 03:20:28 looks like the Golden Mean in a spider web - fascinating! 03:20:37 Is the stock bent while red hot when making a scroll on jigs like this? 03:22:46 Doug, It can be bent hot or cold. Normally the tight center part is bent hot and then the rest cold. 03:21:35 when bending by eye or your first scroll for the jig do you use a set of posts, a bending tool of some sort ? 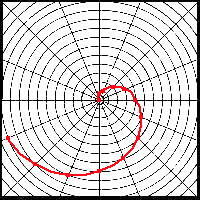 03:23:52 FT, all true spirals are mathematically progressive. Those who try to fit everything into those rectangles are fanatics. 03:24:17 you indicate one of the first jigs you showed us was 1/8" thick, how heavy of scroll material can be worked on an 1/8" jig? 03:25:24 On that jig I bent 1/2" square. The first 4-6" were bent hot. The rest cold. 03:26:10 Most of my scrolls get bent over the horn of the anvil or just curled up hot with a hammer. 03:27:05 I only make jigs when they have to fit a specific space and you need more than 2 or 3. 03:28:13 Hi Guru - I downloaded a picture of that first jig, and don't quite see how it's used. Could you elaborate on some of the details? 03:28:17 The Hossfeld type is expensive to make OR purchase. However, if you are going to make a couple thousand cold bent scrolls it pays off quickly. 03:29:34 The "S" scrolls made with this one had to fit existing wooden brackets that made a triangle. 03:30:17 After scrolling the S's were fit into a triangular for the final fit. 03:30:45 This was part one of two. Bill Epps will be doing the second half, "Scroll Ends" in a few weeks. 03:32:48 These and several other benders can be seen in our Benders article on the 21st Century page. 03:34:25 If there are no more questions, I'll say good night folks!